Aldringham is the posh end of Leiston these days, I suppose. It merges into the agro-industrial greyness towards Coldfair Green; as you head into it from central Leiston, you pass the Ogilvie almshouses, a name we will meet again later. If the village is rather mundane, then the same cannot be said of St Andrew. You head out across the heath towards the fantasy holiday village of Thorpeness, which we will also come back to, and then turn southwards on a track through the forest, out into the pines and broom. Incongruously, a row of 19th century almshouses looms into view, looking for all the world as if it had been picked up from the terraces of east Ipswich and dumped here. And there, at the western end, is the delightful church of St Andrew, looking very pretty among the pine trees. I had first seen it on a dull, dark, dismal day in November 2000, and so it was a pleasure to come back on the hottest day so far of 2010 in bright sunshine. At first sight, the church is entirely Victorian, and might even be contemporary with the terrace. However, a blocked door and lancet in the south chancel wall give us a probable original date of about 1200, and a rood loft stair buttress also tells us of this former, Catholic liturgical age. A very good modern extension leads off from the north doorway. If you had come here 150 years ago, You would have found a tall, ruined 15th century tower, like the one at Corton, 20 miles to the north. 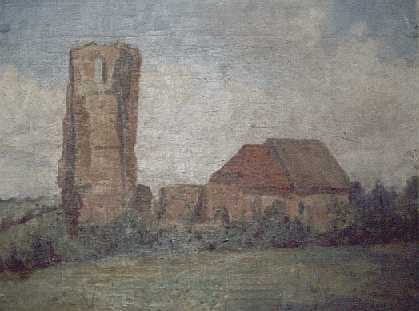 The church was painted in 1842, and you can see the tower in the third small photograph at the top of this page. But that is all gone now, for St Andrew was consolidated and completely refurbished inside and out in the mid 19th century. I think the Victorians made a pretty good job of it. The chancel priest door is blocked, and beside it on a buttress is the parish WWII memorial. The south porch leads down into the body of the nave, and you step down into a church which is full of colour.From a historical point of view the most important survival is probably the 15th century font. This is one of the typically East Anglian fonts, of which about 160 survive in Suffolk, showing angels and evangelistic symbols on the bowl, and lions on the stem. Of all of them, this is one of the best. The seating is banked at the west end, and above it is one of two excellent, large 19th century windows. For such a small church to have two such large windows is rather unusual. This one is by Alexander Gibbs, and shows the disabled man being lowered by his friends through the roof to Christ. The inscription reads This window was placed here in grateful memory of Letitia Caroline Susannah Cannon who died November 8th 1896 aged 81 years, helpless from paralysis during 11 1/2 years. She abounded in most generous gifts to the poor, the church, the churchyard and the endowment. At the other end of the church the window depicts the feeding of the five thousand. These two unusual subjects suggest a particularly evangelical hue to the 19th century congregation here, and create a church like no other in the area. There is a fine, more modern window of St Andrew in a lancet in the south side, which the 19th century restorers here would no doubt have considered idolatrous.. There is an outstanding Art Nouveau memorial in the north-west corner of the churchyard to Letitia Cannon and her husband. I assume that the elaborate ironwork decorative fencing came from the foundry at nearby Leiston. But probably the most memorable thing about this churchyard is the collection of Ogilvie memorials on the southern side of the churchyard. A narrow avenue of box hedging led from the south porch. When I came this way in 2000, this was punctuated by scatterings of parasol mushrooms, which made a very pleasant meal later that night. Today, in the heat of summer, I had been warned to watch out for snakes in the churchyard - adders are common on this wooded heathland. I continued towards what looked like the village war memorial. Indeed, it is used as the village war memorial, but that is not all it is. It is a memorial to one of the Ogilivies, killed late on in the first war; but, as it is so much grander than the simple, pretty one set in the rood stair buttress of the church, it was here in that November that I had found the wreaths of plastic poppies were leaning. The inscription mentions Alexander Walter Ogilvie, who died on October 30th 1918, by name, but also makes reference to Lasting Remembrance of the Great Host of Heroes who made the Supreme Sacrifice 1914-1918. The names of the Aldringham dead are hidden away behind it, as if an afterthought. As I reached it, I was staggered by the massed ranks of large tomb chests on either side of it; Ogilvies to the left of me, Ogilvies to the right. It is the grandest collection of 20th century family tombs in all Suffolk, not excluding the Quilters at Bawdsey. The Ogilvies were fabulously well-to-do, and their name is all over this part of Suffolk, including those almshouses towards Leiston. The Ogilvies lived at Sizewell Hall, and quite literally shaped the map of Suffolk; theirs was the responsibility for building Thorpeness, the jolly holiday resort on the coast a mile to the east of here, and for the land on which the Sizewell nuclear reactor was built, also a mile away. But best of all, they are thanked every wet Saturday by the divorced and separated fathers of Ipswich, who can let their temporary charges loose in the Ogilvie Room at Ipswich Museum, the biggest public collection of Victorian stuffed birds in the Kingdom. There are simply thousands of the things, including a mighty representation of Bass Rock, and all manner of exotic creatures who met their maker during a flight over the Ogilvies' substantial domain. On more than one display case it says this is the only example of this bird ever collected in Suffolk, and so we may assume that Lord Ogilvie killed an awful lot of birds to make sure that he got these few, a thought which has struck me repeatedly on my many visits to the museum. Ironically, the RSPB's huge Minsmere bird reserve now stretches north of the Ogilvies' former property. I wandered around the Ogilvies for a while, and then headed back into the church. It was only now that I noticed a simple brass memorial on the south wall of the chancel. It remembers forty-four year old Benjamin Croft, whose name also appears on the World War I roll opposite. What makes him significant (he isn't an Ogilvie, after all) is that he was killed on 10th November 1918, the last full day of the Great War. What an awful piece of luck for him and his family. In 2000, the memorial had combined with the weather outside to infuse me with a mood of gloom, and I remembered still my feeling of sadness. But in 2010 I stepped out into the sunshine, and got chatting to people having a picnic outside the south porch. They were parishioners taking a break from the late spring tidy-up of the graveyard, and they very hospitably asked me to sit down and join them in a glass of wine. It turned out that the Rector, who I had met in the church, had told them who I was, and it was good to meet some followers of the site. 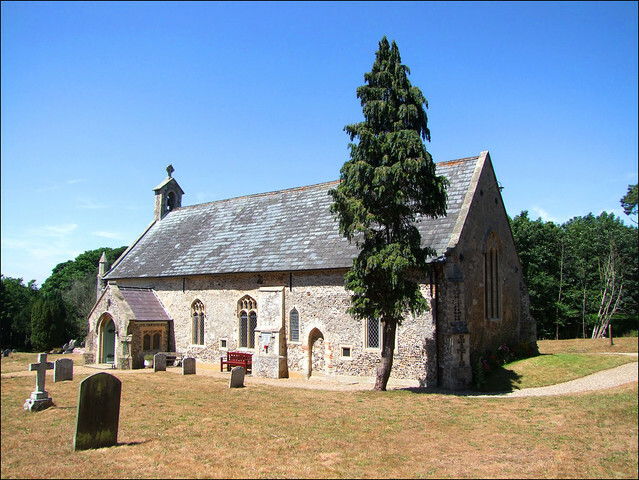 They seemd a very jolly, friendly lot, and I decided that Aldringham church must be a fine place to be a member of the congregation. In 2010, it was the height of the day. I saddled up my bike and set off in the blistering heat towards Knodishall. Back in 2000, the day was ending. I had hoped to head on to find the site of the lost church at Thorpe, and survey the outside, at least, of the 1930s church of St Mary at Thorpeness. But it was not to be, and these would have to wait for another day. The rain was falling steadily, all over Suffolk. I hauled my muddy bike up the muddy path to the almshouses, and set off across the heath, the darkness closing in. On across Coldfair Green, dissolving into the landscape, following Sizewell's mighty pylons to Saxmundham station, and then home.